This hand ventilator setter is used for setting brass ventilators by hand. 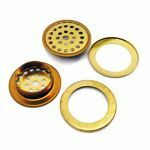 Also known as vents or breathers, these are grommets with small holes in the cap for airflow in denser materials like vinyl or leather. A few even taps with a mallet will set ventilators.